If we have done enough research in the areas of science and ancient knowledge, we may have noticed that numerous ancient symbols have been resurfacing in the latest discoveries in quantum physics. Not only are these discoveries surprising physicists, they are challenging many scientists to reconsider just how interconnected the universe actually is. The fact that we are seeing discoveries in advanced physics depicted in ancient Sumerian art and Buddhist mandalas tell us that these new scientific developments may not be so "new" after all. This is not to say that the rediscovery of these principles are not significant. It is simply to say that much of this knowledge is very ancient, and if this is the case there is a very strong chance that there are those who already possess this scientific knowledge thousands of years in the past. 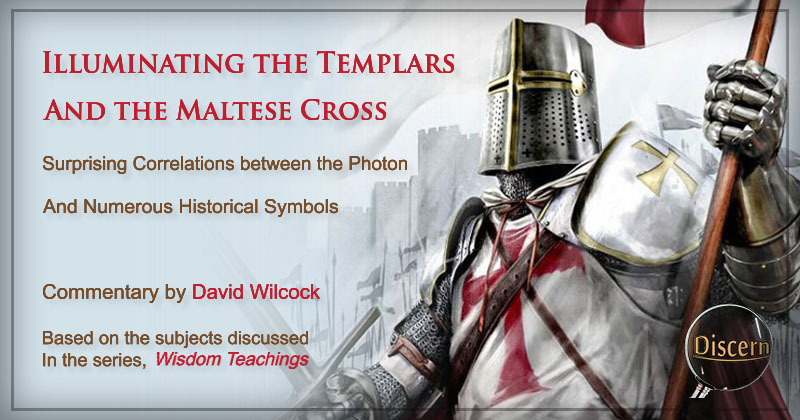 The Maltese cross is the symbol of the historical group, the Knights Templar. This was a group which was a dominant force during the 12th through the 14th century. According to some historians, this group did not entirely end, but was only reformed over the centuries. As successor after successor followed in the footsteps of this group, the ancient knowledge behind the Maltese cross was passed through the generations. It is along these subjects where our topic of interest begins. It was discussed in a recent article how one post doctorate Research Fellow at Stanford University discovered the shape of the photon. Dr. Radoslaw Chrapkiewicz's groundbreaking experiments marked the discovery (or the rediscovery) of the significance of the photon. Though it seems that mainstream science is slow to come to further conclusions about the significance of sacred geometry in the universe, they still continue to reveal parallels between modern physics and ancient knowledge. To add to the details from the previous article, here is one quote from Dr. Chrapkiewicz and Physics.org describing the procedures which led to the groundbreaking developments in quantum holography. "We performed a relatively simple experiment to measure and view something incredibly difficult to observe: the shape of wavefronts of a single photon," says Dr. Radoslaw Chrapkiewicz. In standard photography, individual points of an image register light intensity only. In classical holography, the interference phenomenon also registers the phase of the light waves—it is the phase that carries information about the depth of the image. When a hologram is created, a well-described, undisturbed light wave—the reference wave—is superimposed on another wave of the same wavelength but reflected from a three-dimensional object. The peaks and troughs of the two waves are shifted to varying degrees at different points of the image. This results in interference and the phase differences between the two waves create a complex pattern of lines. Such a hologram is then illuminated with a beam of reference light to recreate the spatial structure of wavefronts of the light reflected from the object, and as such, its 3D shape. "Following this experiment, we were inspired to ask whether two-photon quantum interference could be used similarly to classical interference in holography in order to use known-state photons to gain further information about unknown-state photons. Our analysis led us to a surprising conclusion: it turned out that when two photons exhibit quantum interference, the course of this interference depends on the shape of their wavefronts," says Dr. Chrapkiewicz. Quantum interference can be observed by registering pairs of photons. The experiment needs to be repeated several times, always with two photons with identical properties. To meet these conditions, each experiment started with a pair of photons with flat wavefronts and perpendicular polarisations; this means that the electrical field of each photon vibrated in a single plane only, and these planes were perpendicular for the two photons. The different polarisation made it possible to separate the photons in a crystal and make one of them 'unknown' by curving their wavefronts using a cylindrical lens. Once the photons were reflected by mirrors, they were directed toward the beam splitter (a calcite crystal). The splitter didn't change the direction of vertically-polarised photons, but it did diverge diplace horizontally polarised photons. In order to make each direction equally probable and to make sure the crystal acted as a beam splitter, the planes of photon polarisation were bent by 45 degrees before the photons entered the splitter. The photons were registered using the state-of-the-art camera designed for the previous experiments. By repeating the measurements several times, the researchers obtained an interference image corresponding to the hologram of the unknown photon viewed from a single point in space. The image was used to fully reconstruct the amplitude and phase of the wave function of the unknown photon. "Our experiment is one of the first allowing us to directly observe one of the fundamental parameters of photon's wave function—its phase—bringing us a step closer to understanding what the wave function really is," explains researcher Michal Jachura. The Warsaw physicists used quantum holography to reconstruct wave function of an individual photon. Researchers hope that in the future, they will be able to use a similar method to recreate wave functions of more complex quantum objects, such as certain atoms. Will quantum holography find applications beyond the lab to a similar extent as classical holography? Such existing practical applications include security (holograms are difficult to counterfeit), entertainment, transport (in scanners measuring the dimensions of cargo), microscopic imaging and optical data storing and processing technologies. "It's difficult to answer this question today. All of us—I mean physicists—must first get our heads around this new tool. 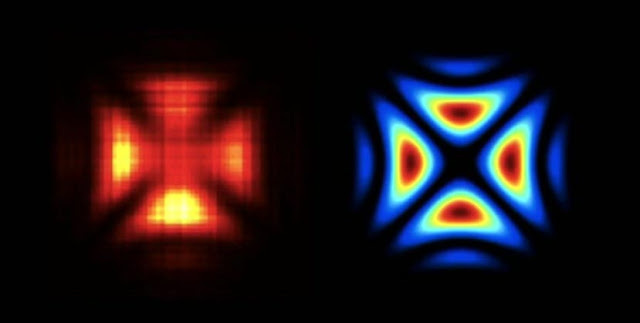 It's likely that real applications of quantum holography won't appear for a few decades yet, but if there's one thing we can be sure of it's that they will be surprising," summarises Prof. Konrad Banaszek. 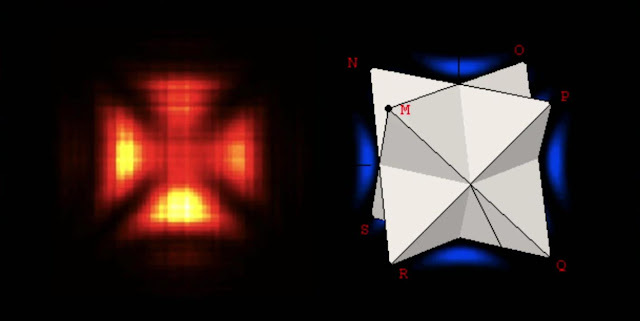 The reason this new area of study is called quantum holography is because the same general method of generating a holographic images is used to reveal the shape of the photon, and as we can see, the photon appears surprisingly like the merkaba. Just as the discovery of the amplituhedron suggested, the findings in quantum holography revealed an uncanny resemblance to the merkaba oriented so that we see one cubical face. This image bears surprising resemblance to the Maltese cross, and this tells us quite a bit about where this ancient symbol may have come from. Just like the Buddhist mandala and the Star of David, the Maltese cross seems to have come from ET sources that gifted this knowledge to the ancient Sumerians. (We will get to the evidence of this in a moment.) There are few other ways that I can see which data from advanced physics could make its way to ancient Earth cultures. If this were the case, it would make sense that this symbol was passed down through the ages by those who sought to maintain control over populations just as the Sumerians and Babylonians did. As stated previously, the photon is not luminescent until it comes in contact with another object. At that point it is contracted and forms a merkaba, and it is at this point when it gives off light. This may remind us of the process of sonoluminescence. 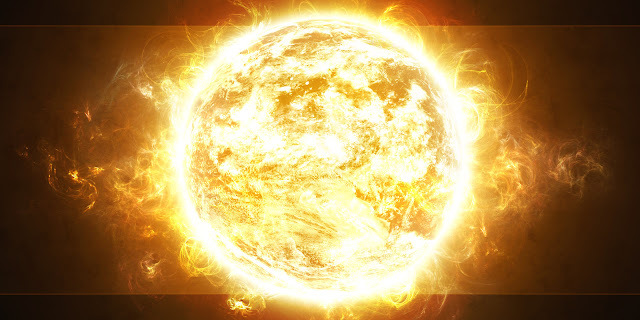 When the bubble of gas is contracted in the spherical flask, it is compressed so intensely that the photons within it are contracted and become luminous. This phenomenon is puzzling to scientists because they have no idea where such intense light and heat could be coming from. Some scientists even believe that this sonoluminescent process could be the same mechanism which fuels stars. The form of the merkaba can be seen in numerous ancient works of art and architecture. In fact, this symbol of the Maltese cross turns up in so many different places throughout the world, it is a surprise that more people have not realized its significance. There are numerous ancient artworks and architecture which depict the form of the Maltese cross. These crosses come in a variety of shapes and sizes, but in general, they each appear to have the same reference of the photon. We may know by now that this symbol represents the essence of the One Infinite Creator, the source and origin of all universal existence, etc. There are a number of ways to phrase the concept, but in general, they all refer to the same general principle. One particular place we can see the form of the photon is in ancient Sumerian relief art. This work (below) clearly depicts the Maltese cross in the form of what looks to be a necklace or pendent worn by this being. This image is actually thought to depict the image of the gods—commonly referred to as the Anunnaki. Notice this figure is wearing something that bears striking resemblance to a wrist watch. Unless ancient Sumerians wore wrist watches, this figure was most likely not from any Earth culture. Another extremely striking depiction of the photon/Maltese cross is the Great Pyramid of Egypt. The form of the Pyramid of Giza may be thought by many to only have four simple sides. However, when this structure is viewed from the top, these hidden details are revealed. The insets are very slight, but when the sun hits these structures just right, the insets can be clearly seen. There seem to be quite a few ancient examples of the form of the Maltese cross. We may know that historians dispute the actual date of the building of the pyramids. However, the Law of One dates these pyramids back to around 25,000 years ago, near the beginning of the last great cycle. This would mean that this knowledge was gifted to the Egyptians at that time. According to the texts, the Ra group brought this knowledge to various cultures in an effort to assist the planet in accelerating spiritual growth. But as with any positive opportunity that comes to us, an equally negative opportunity is presented with it at some level. According the Sumerian text, the Anunnaki brought this knowledge to their culture. This may have been the group we know as the Draco or possibly another group. Whether the group which gifted this knowledge was positively oriented or negative, the elitists of the time seemed to be negatively oriented and perverted this benevolent knowledge into something it was not intended to be. It was distorted and turned into a symbol of control instead of the symbol of unity it originally represented. When we see how large of a span of time the symbol of the Maltese cross seems to occupy, we may begin to wonder just how far this symbol stretches through time. Let's look further. 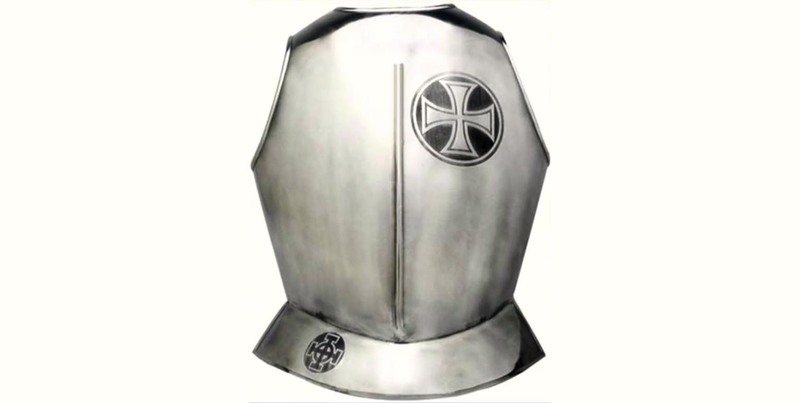 The history of the Knights Templar may be somewhat familiar to us. This is a long history full of military, political, and financial conquest throughout the known world. There is much to be studied on the subject of the Templars, but for now, their chosen symbolism is of particular interest. Notice the clear depiction of the Maltese cross on this knight's staff (below), on his cape, his belt buckle, and the on top of the church in the background. It may have been that artworks like this were meant to communicate the hidden wisdom of ancient symbols so that decedents of the order could keep the knowledge alive. This image (below) bears striking resemblance to some of the ancient art displayed in a number of episodes of Cosmic Disclosure with William Henry. As David Wilcock mentions, the depiction of this man on the throne represents royalty. According to tradition, when an initiate reaches the higher levels of the Templar, they are considered royalty in a sense. The pillow adorned with stars is reminiscent of ancient art depicting Christ sitting on top of the heavens as his rightful place in the cosmos. In this case, it seems that these people thought extremely highly of themselves. However, this is in stark contrast to the true beginning of the Templars, according to mainstream history. A meeting of the Knights Templar - Notice all of the Maltese crosses on their clothing. According to mainstream history, the Templar Knights originally consisted of just nine knights who began as impoverished soldiers. These soldiers are said to have protected the road to the Holy Land in Jerusalem after the Christians invaded during the first Crusades. As the story goes, the Crusades were the military conquest to take back Jerusalem from the Muslims and Persians in the early 11th century. This was an enormous endeavor to undergo. However, despite its difficulty Pope Urban II commissioned this first Crusade in his famous speech, commanding all Christians (including women and children) to march into battle and fight for the city of Jerusalem. The battle was gruesome, but the military conquest was eventually successful in driving the occupants of Jerusalem out and occupying the territory. During the Christian occupation, the Templar knights conducted some type of activity at the former location of the Temple of Solomon. Some believe they were excavating treasure because after they left, they amassed a great amount of wealth and power almost overnight. To be a Templar Knight, a man had to be of noble birth. They had to either marry into the group or be born into the order. 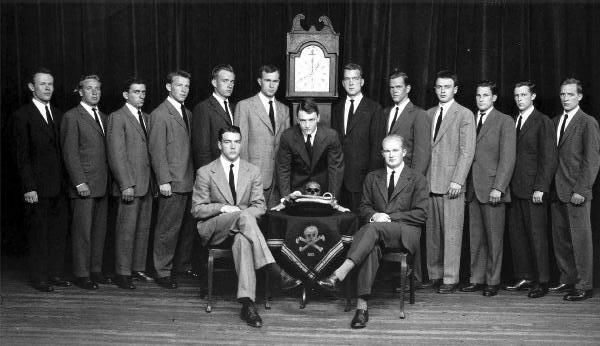 This was a secret society and held many of the well-known characteristics we may be familiar with. After being ceremonially initiated into the order, all of their wealth and possessions belonged to the order from that point on. Their lives were permanently intertwined with the group. If this descriptions sound familiar, it should. This is said to be very similar to the way by which the Illuminati recruited new members. They too choose those who are perceived as being of noble birth, who are already affluent themselves and who are willing to dedicate everything they have to the society, and just like the Templars, these modern-day elitists stop at nothing to attain their goal. According to reports, the Illuminati believe that a person must practice both ends of polarity—both the positive and the negative. This means that they must be exceptionally philanthropic, and yet at the same time, they must be a ruthless killer. This duality represents a portion of their distorted view of polarity as the Law of One describes. To the Illuminati, they themselves are the only positive and enlightened people on the planet. To them, their way is the only way to progress to higher consciousness. Yet it is the influence of this twisted group that has held the planet back from progress for an entire age of time. Despite their double lives, the Templar knights amassed an extreme amount of wealth, power, and influence over a large portion of Europe. These knights were known to be formidable opponents and for a time, they were successful in most of their endeavors. Many believed that this was because "God" was with them. However, it would turn out that this "God" was not exactly the one the Catholic Church promoted to the people. The Templars used every form of sorcery they found in order to help them succeed in battle. These knights were said to be ruthless in their tactics. In fact, enemies were commonly afraid of them because they fought almost as though they were suicidal. It was as if they were fanatical extremists. After all, they had been told that their treasures in Heaven would be immense if they were to die in battle. These characteristics caused the knights to be very similar to the Special Forces of modern times. IN HOC SIGNO VINCES - Latin for "In his sign (or signal) we have victory." This symbol indicates a combination of messages. Notice the swords, indicating that this is an order of war and violence. Also notice that the cross is surrounded by the crown, meaning that government is in control of religion. We may also note that the crown is a stylized representation of ascension. One interesting aspect we find about the Templars is that during the 1150s, these knights no longer guarded the forces of the Crusades. Instead they started protecting the crusaders in a different way by storing their wealth through a complex and orderly system. Many of the soldiers going off to war did not want to carry all of their heavy wealth of precious metals with them. So the Templars devised a way for these soldiers to store their wealth, and in exchange, the Templars handed out receipts to each soldier so that they could receive their wealth back upon their return. This plan went well for a time due to the Church's choice to overlook the violation of usury charges. The Templars attempted to get around the rule which prevented usury charges by claiming that they were simply charging "rent" for the wealth stored. This was still considered usury, but for a time the Church chose to look the other way. Some believe that this was because the Church was grateful for protecting crusaders, but some are skeptical of this theory. This leniency may have been shown toward the knights so that they could maintain secrecy of some kind. This is a lapel pin (1800s) that clearly depicts the Maltese cross, but it is unique because it actually shows four tetrahedrons as the arms of the cross. This is further indication of the true meaning behind the Maltese cross. Also, the shield in the middle represents heraldry, or the bloodline of the visitors from the stars. These are numerous stylizations of the cross. They are all different, but they each have the same meaning. 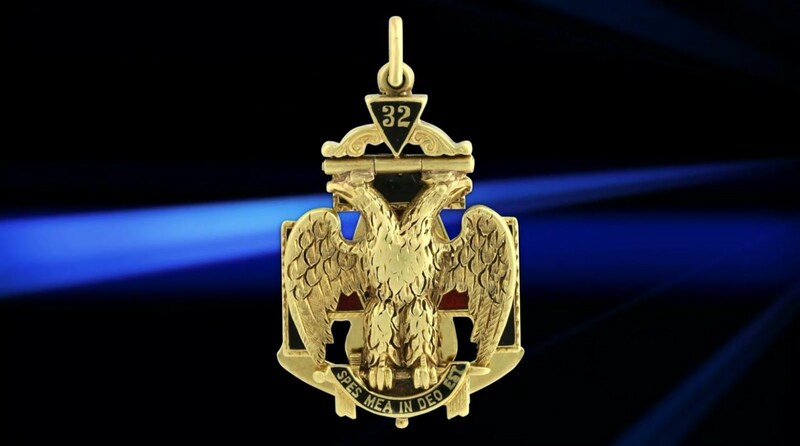 This is a Masonic brooch pin which combines the symbolism of the Templars and the Freemasons. The Maltese cross is implied, as it is covered by the double-headed eagle. The pyramid on the top is the Masonic symbol which represents enlightenment, and the 32 indicates a very high rank of the Masonic order. Notice that the swords are present as well. SPEC MEA IN DEO EST - Latin for "In God, my trust is." Does this sound familiar? 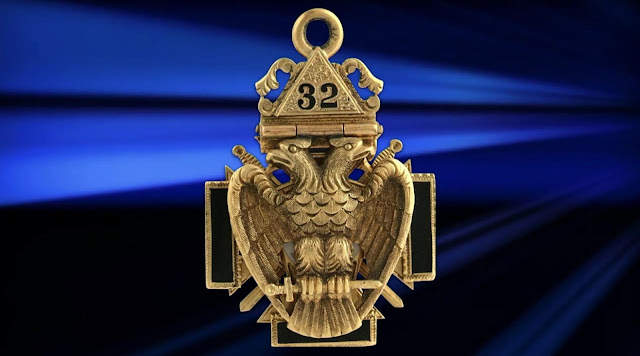 Again, the rank is located in the pyramid at the top, and the Maltese cross is implied behind the double-headed eagle as well. Here we have the two Latin phrases together. 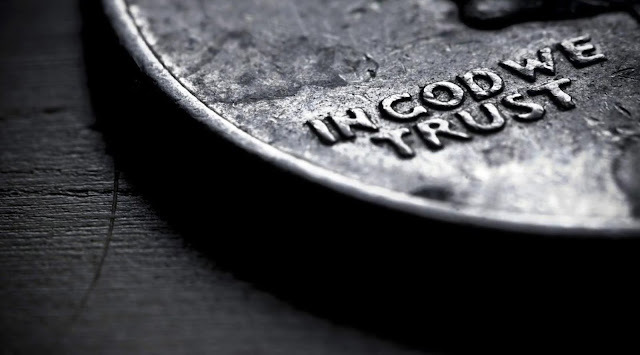 "In God, we trust," and "In his sign we have victory," are clearly seen. We may think this is referring to the god of the bible. However, this does not appear to be the case. As we may have heard, the god the Masons worship in the upper echelons is Lucifer. Also notice that this is not a double-headed eagle. It is a phoenix. On the subject of the Templar, there are many different perspectives of the history of this group. To compliment the mainstream story we have discussed above, here is a portion of an interview with a woman who claims to be a former Illuminati programmer. She goes by the name Slavi, and speaks in an interview about her knowledge and experiences in the Illuminati. Q: The dream of someone wanting to rule the world is nothing new, obviously. History is littered with failed attempts to conquer the world and subjugate the population. How old is the dream for the 'NEW WORLD ORDER' per se, by the Illuminati? Svali: The Illuminati themselves teach that they have been around for centuries and centuries, even during Roman times, and that Alexander the Great was one of their "prototypes" in the ancient world, as was Hitler in modern times. But the Illuminati as we know it today was formed in the 17th Century (out of Catholic roots, ie. the Templar Knights and Roscicrucianism). The idea of a modern 'One World Order' became popular in the 1700's with the ideas of Weisshaupt and others, and they have been working towards this goal since the mid 18th century. Q: Did the Illuminati manipulate societies throughout history, such a [sic] the Egyptian, Roman, British Empire, etc. How far back does the history of the Illuminati stretch and were they always known as the Illuminati, or did they at times operate under different covers with the same goals? Svali: The Illluminati SAY they date back to ancient Babylon on the Fields of Shinar around 3,900 B.C, give or take. But this is probably cult programming and boasting. They state that they are founded on the occult base of all ancient mystery religions and occult practices. But they actually seem to be descended from the Knights Templar during the medieval ages, and the Rosicrucians who were also founded back then. I myself have trouble knowing how much of the "cult history" I was taught as a child by my scholarship teachers was merely programming, and how much is accurate truth, so I cannot really be an objective source of information. Like any group, they tend to want to "idealize" their roots. Q: Does the Illuminati have natural enemies or predators, or competitors with the same goals of global control? Svali: Not that I know of. They are very aware of the Templar Knights, and OTO [Ordo Templi Orientis, a Catholic secret society that is a sister group to the Templar Knights and is involved in lots of occult and illegal activities as well], and while the two groups are split in some areas, they are very sympathetic and share resources with each other. The only true enemy that they see is the Christian church, which opposes all that they do. Because the Illuminati are based in occult spirituality, they despise any group that espouses Judaism or fundamental Christianity as being their mortal enemies. This is because Christians engage in spiritual warfare that hurts their cause. So we can see the similarities between the modern Cabal and the Templar Knights from centuries past. As it turns out, the Knights met an end that was equally as disgraceful as their beginning was thought to be. The Knights Templar would meet the beginning of their end in the year 1197. This occurred in a battle during which many of the knights were killed, causing the rest of the group to become demoralized. According to David Wilcock, the Church as well as many other governing forces began to oppose the Templar order. The Church began to attack, kill, and arrest them due to their abuse of the money system. A Scottish Right Freemanson with Templar cross and cape - Red on white is their trademark color scheme. 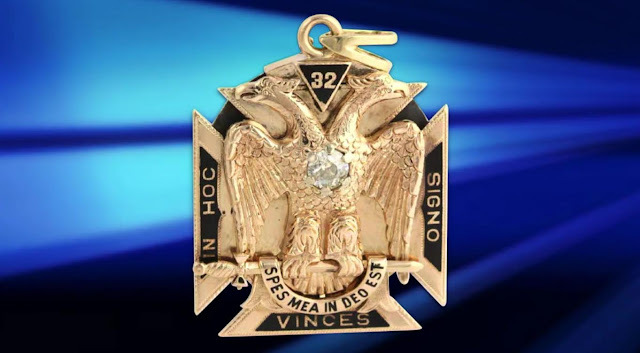 We have the quarter with the eagle on the back, just like the Masonic pendent. We only see, "IN GOD WE TRUST," but we may realize that the other statements apply to this concept as well. The government is the power behind religion, and rule by the sword applies. "In his sign, we have victory," also applies. Notice there is only one head on the eagle. According to Wilcock, the founding fathers debated whether or not they should include that much of the Masonic/Illuminati message. The current dollar is similar to their final result. We have groups of elitists who are an order of their own, and manipulate government and the corporate world to their own advantage. The most notable of these similarities is the fact that we have a government within government. It is commonly said that the Templars were a church within the Church, and an order within an order. Considering what we have seen, it becomes clear how the order and methods of the Templars transferred to the modern day Cabal and the Illuminati. The Templars are actually reported to have regrouped in Western Europe where they commandeered old military ships as their transport. They maintained their secret society and used their combat skills to attack and rob other ships of their wealth. They would kill all of those aboard, steal their gold, melt it down to doubloons and store this treasure in various places in the Caribbean. This is where we get the story of the Pirates of the Carnelian. We can even see a link between the skull and crossbones of the pirates and the Maltese cross. I HAVE A LAPEL PIN JUST LIKE THE ONE IN YOUR ARTICLE. HOW RARE ARE THESE?